Socrates, an early example of an unappreciated philosopher. The fortunes of philosophers — or at least philosophy majors — are a mixed bag, ranging from college teaching adjuncts who can barely pay their rent to tech entrepreneurs. In general, humanities and liberal arts majors tend to have high unemployment rates (9.4 percent, according to a 2014 Georgetown University study), and within that group, philosophy and religious study majors tend to do a little worse, with a 10.8 percent jobless rate, according to the study. 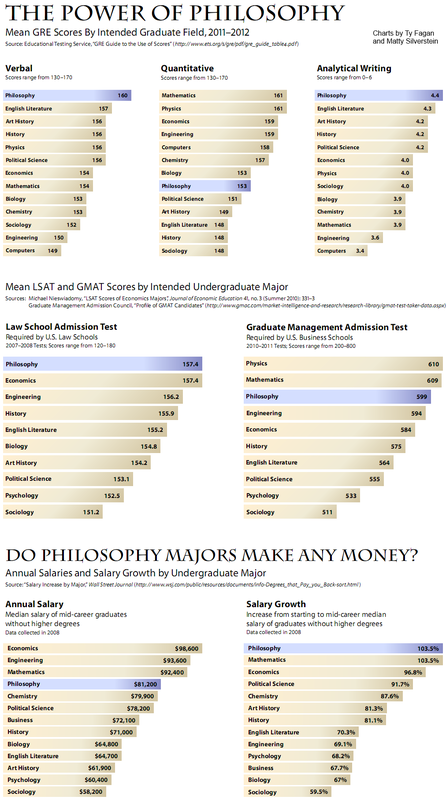 But philosophy majors also have some of the highest scores in the LSAT and GMAT — the required tests for entry to law and business school respectively, according to figures from the Educational Testing Service (ETS). And when it comes to earnings for people who only have undergraduate degrees, philosophy majors have the fourth-highest median earnings, $81,200 per year, out-ranking business and chemistry majors, according to the ETS. Bar none, philosophy majors have the highest salary growth trajectory from entry to mid-career. An example of the very top earners among these degree-holders is billionaire Reid Hoffman, the co-founder of LinkedIn, who has a master’s degree in philosophy from Oxford. In politi-speak, he is definitely what’s called a “job creator.” Or, the candidates could have turned to their debate partner Carly Fiorina, who has an undergraduate degree in philosophy and medieval history from Stanford, and the second-highest net worth of the GOP candidates, stemming from her tenure running Hewlett-Packard. People with liberal arts degrees in disciplines like philosophy go on to do all sorts of jobs; most don’t just sit around and philosophize in coffee shops or even in classrooms. According to PayScale.com, annual wages for people with B.A.s in philosophy range from $37,000 to $83,000. For welders, the site says the salary range is $23,000 to $63,000. Since people with philosophy degrees do many things, one way to track them is by earnings regardless of their day job. According to American Community Survey data, the median earnings of full-time year-round employees ages 30-49 with a bachelor’s degree in philosophy, and no graduate degree, was $51,000 per year from 2010 to 2012. In addition, the Department of Labor (DOL) also keeps statistics on what people earn by job category. “Philosophy and Religion Teachers, postsecondary” earn, on average, $71,350 (and presumably many are college professors with graduate degrees and the associated time-commitment and/or debt). The DOL’s figures show that “Welding, Soldering and Brazing Workers” make $39,570 on average. Two other job categories including “welding” or “welder” have median wages of $40,040 and $36,450. There’s even Virginia motorcycle repair shop owner Matthew B. Crawford who, depending on the day of the week, transforms into Prof. Matthew B. Crawford, Ph.D. in Philosophy. He wrote “Shop Class as Soulcraft,” about what he sees as the deep emotional value of working with your hands as well as its economic gains. Last year, President Obama authorized $100 million to expand vocational education in high schools. Obama also made vocational education part of his plan to expand community college access, urging schools to teach basic skills and do adult education. But with the exception of innovative programs like the P-Tech Schools, many high school programs linked to specific industries still are often seen as dumping grounds for under-performing kids. And most people will not have the chance to make the choice that Prof. Crawford did — to repair motorcycles and teach philosophy, or to combine the skilled trades with what politicians find mock-worthy forms of the liberal arts. Which brings me back to philosophy. While we’re assessing career choices, let me trouble the assertion at the top of my story: that philosophers aren’t loved these days, which implied that everyone just adored them way back when. Actually, in 399 BC, Athenian jurors convicted Socrates of charges including corrupting youth and “failing to acknowledge the gods the city acknowledges.” The penalty was death; his personal method of choice was hemlock tea. Some modern analysts argue that Socrates could have easily talked his way out of the charges or walked away from the sentence, but he chose to die to make the ultimate point about sticking up for the love of wisdom. So, Cliff Notes’-style summary: Philosophy. Your mileage may vary. A lot.